Don't just watch a movie, surround yourself in a movie using Epson's Active Shutter 3D Glasses and your compatible projector. The glasses communicate wirelessly so you see an incredible, vivid 3D masterpiece from the comfort of your home. These glasses are designed to work with the PowerLite Pro Cinema 6010 projector and the PowerLite Home Cinema 3010, 3010e, 5010, 5010e projectors. Box Dimensions (LxWxH) 8.7 x 3.3 x 3.0"
Active Shutter 3D Glasses is rated 5.0 out of 5 by 6. Rated 5 out of 5 by Chris-EL from Awsome 3D!!!! IMAX Theater at Home! I love the way they look, feel, and perform!! Absolutely astonishing 3D quality!!! Rated 5 out of 5 by Dale from Great 3d glasses! These glasses are very good quality and very comfortable. I was worried about the size differences I would need. The glasses have width adjustments that fit my 11 yr old and can adjust to fit my 38 yr old man head! Very happy with the purchase! 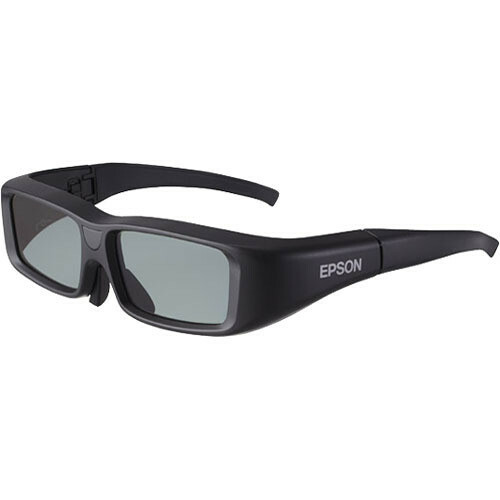 can i use Epson Active Shutter 3D Glasses with BenQ HT2050 3D Projector? Will it work well? It will not. BenQ uses DLP-Link type glasses. These are the recommended glasses:BenQ DGD5 3D Glasses for Projectors with DLP Link 3D TechnologyB&amp;H # BEDGD5 MFR # 5J.J9H25.001 The BenQ DGD5 3D Glasses are designed to provide an immersive 3D viewing experience with BenQ's DLP Link-enabled projectors (with 3D Ready function). It draws power from a rechargeable battery and offers 30 hours of run time (continuous viewing) on a single full charge.